Looking for a simple rig that'll turn your iPhone into a pro level, DSLR-like camera? Then look no further than olloclip! Lots of people spend time capturing photos and videos on their iPhone — so much so that the idea of taking time to pull out your DSLR camera, pop off the lens, adjust the settings, line up your shot, readjust the settings, and then finally shoot, is exhausting; especially when you have a perfectly good iPhone ready to go in your back pocket. I've been shooting with the iPhone 7 Plus for about a year and a half now, and I'm still head-over-heels in love with the camera. The photo quality is stunning, the slow-mo takes my breath away (especially when paired with underwater shots), and the crisp, clean images I get from my iPhone recently have allowed my DSLR to gather a li'l dust. Not only is it the convenience of the iPhone that's had me leaving my DSLR at home more and more, but also the price of accessories and lenses: some macro lenses can cost up to $650, while fisheye lenses can cost thousands. Meanwhile with an iPhone, you can pick up a pack of inexpensive (but not great quality, admittedly) lenses for under $20 on Amazon, and that would typically include a fisheye, macro, and wide-angle lens at the very least. While some pro photographers would argue that shooting with your iPhone at any point is blasphemy, we do live in an age where mobile devices like your iPhone are capable of shooting incredibly professional looking images with just a few swipes and taps, and olloclip's partnership with Incase AKA the olloclip Filmer's Kit is the near-perfect accessory to take your already pro images to super WHOA images. What exactly is the olloclip Filmer's Kit? The kit is designed to enhance your video and photography quality on your iPhone, while making things convenient and easy-to-shoot on the move. What do you get with the olloclip Filmer's Kit? The olloclip comes with what looks like a clip-on bar that attaches to the top of your iPhone. Using the bar, you can secure your specific lenses and attach them directly to your iPhone's camera. 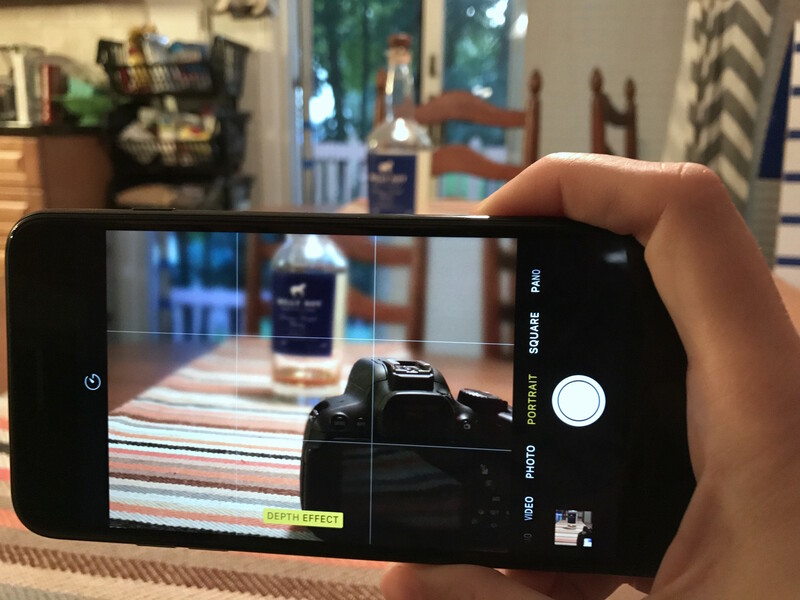 It might take a second or so to line up the camera with the olloclip lens, especially if you're using a dual-lens camera like an iPhone 7 Plus or iPhone 8 Plus. Once the lens is secure, you'll be able to look at your screen and see the change the lens will bring to your camera. Keep in mind if you're shooting macro, things will look super blurry until you're close enough to the object you want to shoot. You can also use the lenses to shoot with your front-facing camera, meaning that if you want to take a fisheye selfie, or get a super close-up on your makeup using your macro, or even just a beautiful shot of the scenery behind you with your ultra-wide, olloclip's got you with some serious selfie insurance. It is worth noting that you should use your olloclip lenses without a case on, unless your case is paper thin. I have a relatively thin case on my iPhone, but I still take it off for the best quality photos with the olloclip. With the Pivot video grip that comes with the Kit, you can easily spread the holders and slide your iPhone into the rubber clamps, keeping it secure and steady as you're shooting. To take it off, simply lift up the clamps and remove your iPhone; the Pivot will shrink back to normal size, and you can once again bend it to store it in the Incase kit. The lenses. Hands-down, the lenses. I've always been a big fan of olloclip lens quality. The brand has always been consistent in making crisp, clean, beautiful-shooting lenses that are easy to attach to your iPhone and simple to remove, while still clinging on in situations like hiking up a steep mountain in Palm Springs. As someone who isn't a huge fan of telephoto lenses, I still enjoyed playing around with the Filmer's Kit lens a few times white trying to capture shots of lizards I didn't want to get to close to while in California, and while I loved the quality of the super-wide and ultra-wide lenses to pieces, my heart will still forever be with olloclip's fisheye lenses. They're just so incredibly fun and exciting to shoot with. The other thing that bothered me about the Pivot was the fact that there was no button attached to the base of the device that would allow me to take my photo with one hand. When I think of products like a selfie stick, you typically understand that there's a button or a camera trigger on the handle that allows you to take the picture single-handedly. I wrongly assumed that the Pivot would have a button that would let me snap my photo or start recording my video — olloclip and all — with just one swift motion, but I found myself lining up my shot with the Pivot and then reaching over to take the screen, which would jiggle the Pivot a bit and blur my shot because, again, it's not an actual camera stabilizer. One of the coolest parts of the Pivot though was the ability to attach a GoPro mount if need be, making it not only versatile for phones, but also other compact cameras. Does the Pivot work as a great phone holder for something like video? Kind of. It helps smooth things out a bit, but in comparison to other iPhone gimbals and stabilizers out there, this guy falls a little flat. You can pick up your very own olloclip Filmer's Kit for $199. While some people may think that nearly $200 for five lenses and a kind of meh phone holder is a lot, I really would beg to differ. This collaboration between Incase and olloclip has brought a new level of professionalism to mobile photography, and while not all the pieces in the Kit are 100% up-to-snuff, there is definitely room to make this little Filmer's Kit the go-to tool for mobile photographers, both iPhone and beyond. Are you a big fan of using external lenses with your iPhone? Would you prefer to stick to a DSLR camera instead? Let me know what your comments are down below and whether or not you'll be picking up a lens or the entire kit from olloclip.